I live in Bologna, Italy. It’s certainly one of the more uncommon places for American tourists to visit when they come to Italy, and an even more uncommon place for expats to settle down in. Maybe its because of the common confusion between the Oscar Meyer bologna sandwich meat (pronounced “bah-low-nee”) whose mysterious, unappetizing ingredients have very little to do with the actual city of Bologna (pronounced “bah-low-nya”). Or maybe it’s simply because Bologna doesn’t have that initial infatuating beauty that exists in popular Italian cities such as Florence, Venice or Rome. I honestly don’t really know why people don’t know about Bologna. It’s a great city! It has some of the best food in the world! Nevertheless, I do know one thing – although I love Bologna dearly now, I must admit it wasn’t always so. When people ask me why I chose Bologna (a very common curiosity), I’m always a bit ashamed to admit that I didn’t actually choose Bologna. 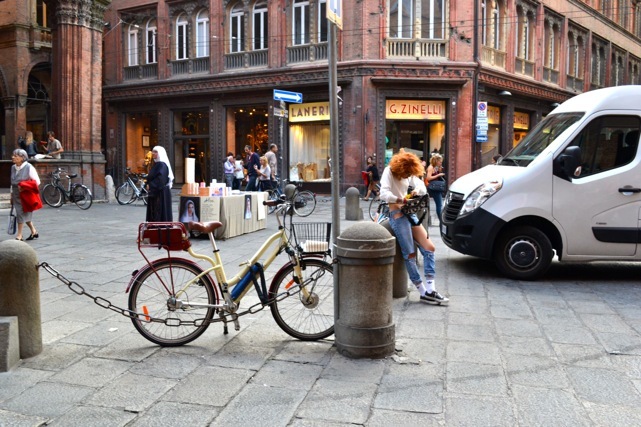 The truth is when I first came to Italy I dreamed of starting my Italian new life in Florence – you know, the typical Under-the-Tuscan-Sun drama. Renaissance charm, elegant architecture, surrounded by the beautiful Tuscan hillsides – bella Firenze! It was for me, as for many others, the most beautiful city in Italy. Love at first sight. As fate would have it, Firenze and I were not meant to be together (one of my first of many experiences in Italy that taught me that some things in life simply don’t go the way you plan them to). When I first moved to Italy, I was living in Florence, searching for a teaching position. After two months of job hunting, my bank account was running pretty low and I knew I had to take the first teaching job I could get. So when an English school in Florence offered me a teaching position at their other location in Bologna, I accepted. I thought after a few months, I would be able to transfer back to Florence when a position there became available. Of course, I never did and here I am, more than two years later, still living in Bologna. I could have moved by now if I wanted to, but I haven’t because you see, Bologna not only chose me, it seduced me. I wish I could take credit for using this idea of “seduction” to describe my relationship with Bologna. Unfortunately, I’m borrowing it from someone who came before me, another victim to Bologna’s seductive powers. Her name is Mary Tolaro-Noyes and she’s the author of a book called Bologna Reflections. Like me, Mary is an American who sort of stumbled upon Bologna, without really expecting to fall in love with it. She first came to Bologna in 1994. Although she now lives in California, every year since then she has returned to Bologna. Recently, I had the honor to meet Mary. We spoke about Bologna and how it seduced us. Although she’s old enough to be my Mom, we share a very similar sentiment about Bologna. We didn’t choose Bologna – Bologna chose us. It wasn’t love at first sight. Yet somehow through a series of what I like to call “aha!” moments, we fell in love. 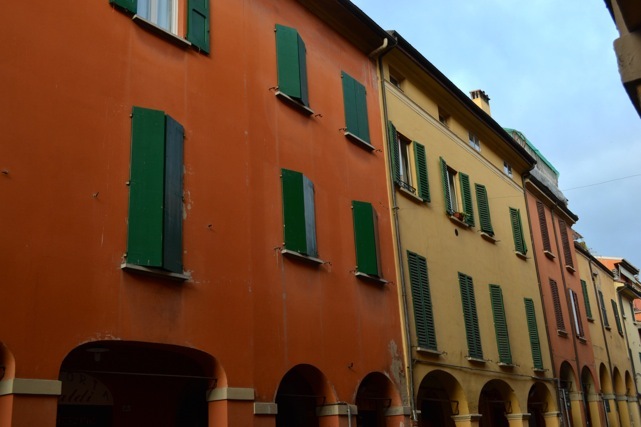 Why do two American women like us love Bologna? 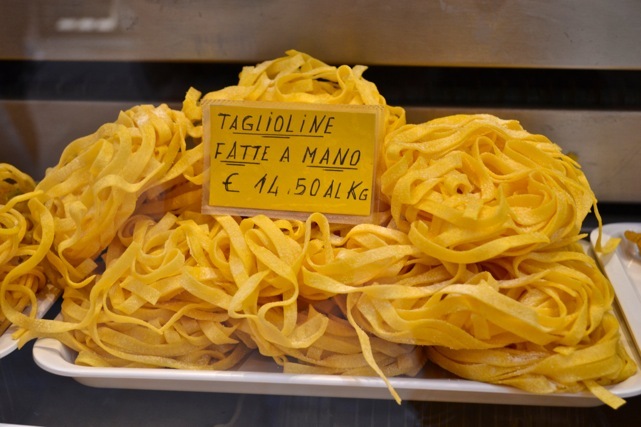 For starters, there’s the amazingly rich food – fresh handmade egg pasta, rolled out and cut into long golden tagliatelle ribbons or cut into squares, stuffed with pork meat, and carefully shaped into the famous tortellini bolognesi. The mortadella (baloney’s glorified, much tastier cousin) melts in your mouth like butter. OH and the butter! I mean, they use butter instead of olive oil here. Where else in Italy do you see butter? 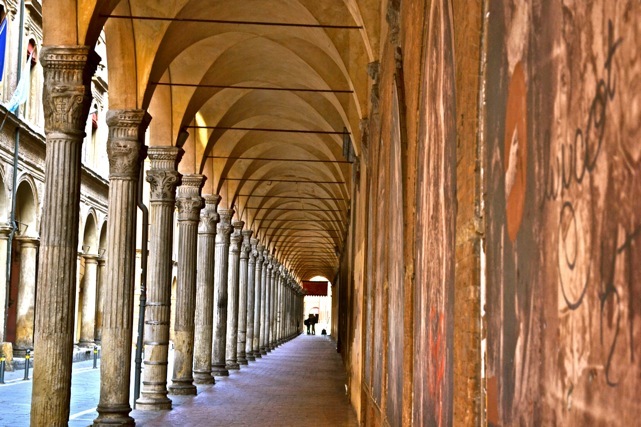 Then there’s the incredibly unique architecture – did you know that Bologna has more than 40 kilometers of covered walkways? Thanks to the protective portici or archways, one can freely walk around the city, rain or shine, always covered. 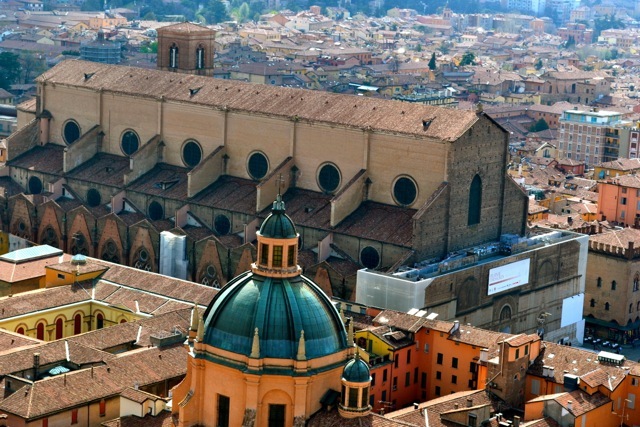 Another amazing fact about Bologna is that it is home to one of the oldest universities in the world. It’s a city full of history, but also young life, which maintains a bustling, alive atmosphere, but also an affordable cost of living. I could go on and on about all the wonderful things that I love about Bologna, but it probably wouldn’t make much of an impact on someone who has never experienced it themselves. So I’d like to challenge anyone planning a visit to Italy soon to work into their itinerary a stop in Bologna. 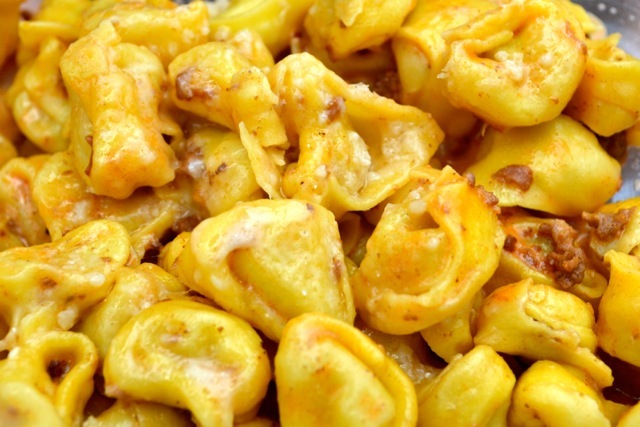 It’s conveniently located between Florence and Venice (in fact it’s a main stop on many of the northbound train lines to Venice), and although I’d recommend spending at least several days here, one or two days is sufficient to have a taste of its seductive splendor – or at least its tortellini! 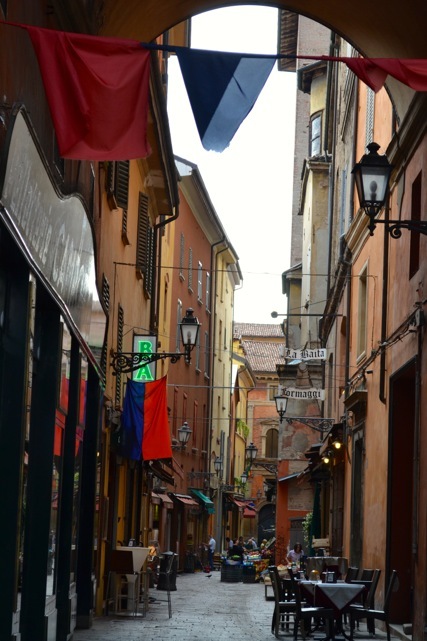 Thank you for this beautiful post on Bologna, Sarah! !